The various techniques presented here include the estimation of demand curves and the area beneath them, analysis of market-like transactions, use of production approaches that consider the contribution of water resources to the production process, estimation of the costs of providing alternative sources of water, as well as other techniques used to estimate environmental resources more generally. The techniques reflect the extent to which the goods and services provided by water resources touch on the welfare of society either as direct determinants of individuals well-being (e.g. as consumer goods) or via production processes (e.g. as intermediate goods). They are grouped here according to whether the techniques rely on observed market behaviour to infer users value of water resource functions (indirect techniques), or on whether they use survey methods to obtain valuation information directly from households (direct techniques). Some of the techniques require the analyst to undertake primary and secondary data collection, econometric analysis, discounted cash flow analysis and optimization analysis. The aim here is to provide a brief overview (Table 6). Further details of the underlying theory and practical implementation of the techniques is provided in general texts including Braden and Kolstad (1991), Freeman (1993), Pearce, Whittington and Georgiou (1994), Georgiou et al., (1997). In addition, Young (1996) provides a more detailed procedural handbook for field practitioners on the evaluation of some of the more common functions of water resources, such as water supply. Used where market prices of outputs (and inputs) are available. Marginal productivity net of human effort/cost. Could also be approximated using market price of close substitute. Includes transactions in water rights. May require shadow pricing. Derive value from the households or firms inverse demand function based on observations on water use behaviour. Budget analysis used to estimate return attributable to water. Water treated as one input into the production of a good. The total returns are calculated; all non-water expenses are subtracted. Change in net return from marketed goods: a form of (dose-response) market analysis. Derive an implicit price for an environmental good from analysis of goods for which markets exist and which incorporate particular environmental characteristics. Costs incurred in reaching a recreation site as a proxy for the value of recreation. Expenses differ between sites (or for the same site over time) with different environmental attributes. Construction of a hypothetical market by direct surveying of a sample of individuals and aggregation to encompass the relevant population. Problems of potential biases. Individuals are asked to rank several alternatives rather than express a willingness to pay. Alternatives tend to differ according to some risk characteristic and price. The costs that would be incurred if the catchment function were not present, e.g. flood prevention. Costs incurred in mitigating the effects of reduced environmental quality. Represents a minimum value for the environmental function. Potential expenditures incurred in replacing/ restoring the function that is lost; for instance by the use of substitute facilities or "shadow projects". A total value approach; important ecological, temporal and cultural dimensions. Dose-response: takes physical and ecological links between pollution ("dose") and impact ("response") and values the final impact at a market or shadow price. 1 Perfect restoration of the ecosystem or creation of a perfectly substitutable 'shadow project' ecosystem, which maintains key features of the original, might have the potential to provide the same non-use benefits as the original. However, cultural and historical aspects as well as a desire for 'authenticity' may limit the extent to which non-use values can be 'transferred' in this manner to newer versions of the original; this is in addition to spatial and temporal complexities involved in the physical location of the new catchment or the time frame for restoration. Indirect approaches rely on observed market behaviour to deduce values. They include: observations based on market transactions, derived demand functions, the travel cost method, hedonic pricing approach, averting behaviour method, residual imputation approaches, replacement cost/cost savings methods, income multiplier approach, and dose-response technique. The economic value of marketed goods and services is indicated by the market price, adjusted for any distortions. Market prices are adjusted to allow for any subsidies, taxes and trade distortions, converting them to 'shadow prices' that reflect the true economic value to society. Observations of transactions in water rights offer potential to provide relatively simple means of determining economic value. The use of market analysis techniques is outlined in Young and Haveman (1985) with references to studies where each method has been applied. Market transactions have been observed, for example, when considering the demand for drinking-water by municipal users. Studies of such transactions have been conducted in the southwestern states of the United States of America (Saliba and Bush, 1987), and elsewhere in the world (Easter and Hearne, 1995). A households or firms inverse demand function can be employed to estimate the users willingness to pay for water. Transactions concerning water are observed between water utility suppliers and individual water users, usually involving a 'take it or leave it' price schedule. Despite the usual monopolistic nature of supply, because the buyer can buy as much as desired at the price schedule, it is possible to derive inferences on willingness to pay and demand, provided sufficient observations are observed across variations in real price. The data are obtained preferably from observations on water use behaviour of individual households. As this can be costly, aggregate data from suppliers is often used. Statistical regression analysis is employed to estimate the parameters of the demand equation. Many natural resources, such as lakes and rivers, are used extensively for the purpose of recreation. It is often difficult to value these resources because no prices exist for them from which demand functions can be estimated. To enable valuation, the travel cost approach takes advantage of costs of travel that are incurred by individuals in visits made to recreational sites. The costs of travel (the costs of transport plus the value of time) are used as implicit prices to value the service provided and changes in its quality. Travel costs measure only the use value of sites and are usually limited to recreational use values; the option and existence value of the sites are measured using other techniques. There are two variants of the simple travel cost visitation model. The first can be used to estimate (representative) individuals recreation demand functions. The visitation rate of individuals who make trips to a recreational site are observed, as a function of the travel cost. The value of the recreation site to the person is measured from the area under the individuals demand curve: the total recreation (use) value of a site is the area under each demand curve summed over all individuals. This 'individual' travel cost model requires that there be variation in the number of trips that individuals make to the recreational site in order to estimate their demand functions. A particular problem associated with this model is that such variation is not always observed, especially as not all individuals make a positive number of trips to a recreational site. Indeed, some individuals do not make any. Where the data analysis makes use of standard statistical techniques such as ordinary least squares, non-participants are excluded from the data sets. This exaggerates participation rates and results in the loss of potentially useful information about the participation decision. However, inclusion of data on individuals in the sampling area requires use of more complex statistical methods - in particular, discrete choice models. The second variant, known as the 'zonal' travel cost model, estimates aggregate or market demand for a site using standard statistical techniques. The unit of observation is the "zone" as opposed to the individual. Zones are specified as areas with similar travel costs; the region surrounding a site is divided into zones of increasing travel cost. The method entails observation of the number of visits to the recreational site per capita of population for each zone. Data are again collected through a survey of visitors to the site. The individual travel cost model is generally preferred to the zonal variant. The latter is statistically inefficient as it aggregates data from a large number of observations into a few zonal observations. Moreover, it assumes that the cost of travel to the site for all individuals within each zone is equal, which is often not the case. For both variants, the demand curve is estimated by the regression of the visit rate against socio-economic factors (such as income), the travel cost of visiting the site and some indicator of site quality. Therefore, the data requirements are considerable. For the individual model, data is required on each individuals socio-economic characteristics. In the case of the zonal model, these data are required for the population of each zone. Data are also required on the nature of each trip to the site, the distance travelled, time taken and cost of travel. The data are usually gained from existing or specially commissioned surveys. The method also requires a measure of site quality, which can be an intangible variable. A measure of site quality can range from angling catch rates to biochemical indicators such as concentrations of dissolved oxygen. The key issue is that the measures of site quality used be robust in relation to measures that individuals perceive as relevant. Unless the site that is being valued is unique, individuals have access to substitute sites that they can use for the same or similar recreational activities. Omission of substitute sites from the analysis creates a source of bias in the analysis. However, there is no simple means of incorporating substitute sites into the individual and zonal travel cost models presented here. Multisite models can be used. These vary in their complexity and their ability to explain substitute behaviour. Judgement on the part of the analyst is required to determine which substitute sites to include. Restrictions are often placed on site characteristics (some studies are limited to 'typical' sites) or demand equations (such as the use of 'pooled' models). Moreys (1984, 1985) 'share' model considers the allocation of an individuals fixed time budget between sites. This accounts for site substitution, but at the expense of explaining the total amount of time allocated to recreation. The travel cost method is a technically well-developed valuation approach, which has been employed widely in the past two decades. Its strength is that, in theory, it is based on observed behaviour. However, the technical and data requirements should not be underestimated. Travel cost is unlikely to be a low cost approach to valuation of non-marketed services. Hedonic pricing employs differences in the prices of marketed goods to derive the value of environmental characteristics. Marketed goods can be viewed as comprising a bundle of characteristics; for some goods, these include environmental characteristics. The differential prices that individuals pay for such goods reflect their preferences for environmental quality. Statistical analysis of the prices and characteristics of the goods is employed to derive an implicit value for environmental quality. Taking housing as an example, hedonic pricing assumes that the expected stream of benefits of living in a property is capitalized into the market value of the property. For example, two properties in areas popular for water-based recreation that differ only in respect of water quality have different market values, owing to peoples preferences for the difference in water quality. Hedonic pricing uses this difference in value as the implicit price of the difference in water quality. With adequate data and analytical skills, it is possible to determine the implicit price for environmental quality for properties that differ in not just one but a number of factors. Hedonic pricing requires data that can be used to relate house prices to relevant characteristics of individual properties (characteristics of the house, e.g. number of rooms and type of neighbourhood, and environmental characteristics, e.g. noise, and water quality). Data on sale prices for actual market transactions are preferred over individuals own valuations of their property. The data are used to estimate a hedonic price function, which describes all points of equilibrium in the housing market between sellers offers and buyers bids for the environmental characteristic of interest. The implicit price of the environmental characteristic is given by the responsiveness of property prices to change in the characteristic, as specified by the partial differential of the hedonic price function. A functional form for the hedonic price function is identified that best fits the data. This determines the functional form of the marginal implicit price function. The price is not necessarily constant, it might fall with increases in the characteristic, or it might be dependent on the level of another property characteristic. To obtain a value for changes in the environmental characteristic of interest, its implicit price (as indicated by the hedonic price function) is regressed against physical and socio-economic variables that are thought to influence demand for housing. The supply of housing is assumed fixed in the short run in order to enable identification of the demand or bid function, which is required for benefit estimation. Identification of a bid function is problematic. All consumers within a housing market face the same equilibrium price schedule, or hedonic price function. Hence, the observation of a single consumers behaviour provides only one point on that consumers bid function. Other marginal prices are observed only for other individuals, so they provide no indication of the likely reaction of the original consumer to varying prices. A number of solutions to the identification problem have been proposed. One option is to restrict variables or functional forms so that they are different between estimation of the hedonic price function and estimation of the bid function. The preferred alternative is to use data from spatially- or temporally-separated markets so that individuals do not face the same hedonic price function. However, this requires that consumers be similar between these separate markets. Hedonic pricing rests on a number of stringent assumptions. It assumes a freely functioning and efficient property market, and that individuals have perfect information and mobility. These conditions need to be met for individuals to buy the property and the associated characteristics that they desire and so reveal their demand for environmental quality. In reality, a large part of the housing stock may be in the public sector, and so subject to price controls. The market may be segmented, resulting in restrictions in mobility between areas. Individuals may not be fully informed about the environmental characteristics of properties prior to purchase. The market may not be in equilibrium, resulting in implicit prices that represent upper or lower boundary estimates of the true price. In many developing countries, the property market is administered, preventing free operation of the price mechanism. Even where markets operate freely, records of transactions are not usually kept in any detail, severely restricting availability of data. For this reason, hedonic pricing is rarely applied in developing countries. A further assumption is that the measure used for the environmental characteristic in hedonic pricing reflects individuals perceptions. Although an objective quantitative measure is required for the analysis, it may be that people perceive the environmental characteristic qualitatively. A broader measure of environmental quality may be needed if individuals do not discern changes in an individual variable. A further complication arises in the statistical analysis. If correlation occurs between variables, a trade-off has to be made between multicollinearity and bias owing to the omission of significant explanatory variables. Hedonic pricing has a sound theoretical basis and is capable of producing valid estimates of benefits as long as individuals can perceive the environmental change of interest. Hedonic pricing has been employed to produce reliable estimates of the values of actual environmental changes such as improved water supply. Perfect substitutability provides the basis for the averting behaviour and defensive expenditures technique. This technique focuses on averting inputs as substitutes for changes in environmental characteristics. For example, expenditures on sound insulation can be used to indicate householders valuations of noise reduction; and expenditure on liming might reflect the value of reduced water acidification. The approach requires data on change in an environmental characteristic of interest and its associated substitution effects. Fairly crude approximations can be found by looking directly at changes in expenditure on a substitute good that arise as a result of some environmental change. Alternatively, the value per unit change in an environmental characteristic can be determined. This involves determining the marginal rate of substitution between the environmental characteristic and the substitute good, using known or observed technical consumption data. The marginal rate of substitution is multiplied by the price of the substitute good to give the value per unit change in the environmental characteristic. Where observed averting behaviour is not between two perfect substitutes, the value of the environmental characteristic is underestimated. For example, if there is an increase in environmental quality, the benefit of this change is given by the reduction in spending on the substitute market good required to keep the individual at their original level of welfare. However, when the change in quality takes place, the individual does not reduce spending (in order to stay at the original level of welfare). Income effects cause reallocation of expenditure between all goods with a positive income elasticity of demand. Consequently, the reduction in spending on the substitute for environmental quality does not capture all of the benefits of the increase in quality. Further problems with the approach are that individuals may undertake more than one form of averting behaviour in response to an environmental change, and that the averting behaviour may have other beneficial effects that are not considered explicitly (for example, the purchase of bottled water to avoid the risk of consuming polluted supplies may also provide added taste benefits). Furthermore, averting behaviour is often not a continuous decision but a discrete one, e.g. a water filter is either purchased or not. In this case, the technique again gives an underestimate of benefits unless discrete choice models for averting behaviour are used. Therefore, simple avertive behaviour models can give incorrect estimates of value where they fail to incorporate the technical and behavioural alternatives to individuals responses to change in environmental quality. Nevertheless, although the technique has rarely been used, it is a potentially important source of valuation estimates as it gives theoretically correct estimates that are gained from actual expenditures and which thus have high criterion validity. The use of water in a production process can be determined using the residual imputation approach. This is a form of a budget analysis technique that seeks to find the maximum return attributable to the use of water by calculating the total returns to production and subtracting all non-water related expenses. The value of the product is allocated among the range of marketed inputs that go into its production. The residual value is assumed to equal the returns to water and represents the maximum amount the producer would be willing to pay for water and still cover input costs (Naeser and Bennett, 1998). If only variable input costs are subtracted, then a short-run measure of the value of water is derived. If the costs of all non-water inputs are subtracted (including a normal rate of return on capital), then a long-run value is obtained. The validity of the approach requires: (i) that profit maximizing producers employ productive inputs up to the point at which marginal product is equal to the opportunity cost; and (ii) that the total value of the product can be divided, so each input can be 'paid' according to its marginal productivity and the total value of product is thereby exhausted. The approach is sometimes categorized as a farm crop budget technique in applications to agriculture. A difficulty is that the residual return (after subtraction of the costs of all measured non-water inputs) is the return to water plus all unmeasured inputs, and hence will result in overstatement of the value of water. The approach is also extremely sensitive to small variations in assumptions concerning the nature of the production function or prices. Thus, it is most suitable for use in cases where the residual input contributes significantly to output. Calculation of residual values requires considerable information and accuracy in allocating contributions among the range of resource inputs. Variants of the residual imputation approach include: yield comparison, and optimization models. In its application to irrigated agriculture, the yield comparison approach values irrigation water as the difference in per acre returns between irrigated and non-irrigated land, using observed farm budget data. It is assumed that the additional net returns obtained from the use of irrigation in the production process represent the maximum amount that the producer would be willing to pay for use of irrigation water. However, the approach assumes homogeneity in land, crops, husbandry, quality of produce and price between irrigated and non-irrigated production. The heterogeneity that occurs in these factors in reality brings into question use of the difference in net returns as the net willingness to pay for irrigation water. Optimization models are used to provide mathematical solutions to problems that entail maximization or minimization of an economic objective subject to specified constraints to the economic objective. In generating the optimal solution to the problem, the models reveal the associated economic value of all inputs. Two types of optimization model are discussed here: mathematical programming models and dynamic optimization models. Mathematical programming models tend to be static one-period models. They model economic problems in which the economic agent (consumer, central planner, or firm) seeks to optimize (maximize or minimize) a single objective function (e.g. surplus, costs, profit or revenue) over a specific time period, while facing constraints that restrict choice to certain levels of inputs or outputs. The models can determine marginal or non-marginal values for use of water as an input. Water enters mathematical programming models as an input constraint, such that its marginal value is found by relaxing the water constraint by adding a unit to the water available for production and calculating the difference between the optimal value before and after relaxing the constraint. This marginal value of water is also known as the 'shadow value' of water. Non-marginal changes can be evaluated similarly, and also changes in the shadow value of water can be calculated for exogenous changes in output prices, input prices, or constraints. Mathematical programming models are often used to determine the value of irrigation water and groundwater in situations where detailed data are available for a few representative agents. Dynamic optimization models are used to indicate the optimal outcomes for separate periods in frameworks that involve multiple time periods. In a similar manner to mathematical programming models, they can determine marginal and non-marginal values for water and the impacts of changes in other variables on the value of water. Dynamic optimization models have been used to measure the value of water in allocation schemes, irrigation policies, and water quality projects. The replacement cost estimates the benefits of an environmental asset based on the costs of replacement or restoration. The replaced or restored asset is assumed to provide a direct substitute for the original. The technique is used widely because the data required are usually readily available from actual expenditures or estimated costings. The underlying assumption is that the costs of replacement equal the benefits that society derives from the asset. However, the benefits derived from the asset could substantially outweigh the costs of renovation or restoration, in which case the technique will underestimate the value of the asset. Thus, the replacement cost is a valid measure of economic value only in situations where the remedial work is required to comply with an economically determined environmental standard. Use of the replacement cost assumes that complete replacement or restoration is feasible. In the case of environmental assets, this often is not the case. There are also temporal issues as replacement or restoration of an alternative water resource, e.g. a wetland, may not coincide directly with the damage or loss of the original resource. Because of the potential for confusion between costs and benefits, the replacement cost technique should be used with care, and only where benefits cannot be estimated easily. The cost savings method is similar to the replacement cost, but it determines the value of water in terms of the savings in costs made through use of a good or service provided by water versus the next best (cheapest) alternative source of the good or service. The method is commonly employed to value use of water for transportation, and it can also be applied to other uses of water. The value of using water as a means of transporting goods is measured in terms of the cost savings that result from not transporting the same goods via an alternative means, typically by train. The approach does not allow for the large differences in time costs between different transport modes (Gibbons, 1986). The method has also been used to value hydroelectric power generation by estimating the difference between the cost of generating hydroelectric power and the next cheapest alternative method of power generation (e.g. coal). As with replacement costs, the approach equates cost savings with value. Hence, it can be criticized on the grounds that it assumes implicitly that demand will be unresponsive to changes in costs. In certain instances, dose-response functions can be established between changes in environmental variables (the dose) and the resultant impact on marketed goods and services (the response). Where this is the case, a dose-response function can provide the basis for valuation of the environmental variable of interest; this is the main technique used to derive economic values for air pollution. Valuation is carried out by multiplying the physical dose-response function by the price or value per unit of the impact (usually some form of physical damage) to give a 'monetary damage function'. The latter is equivalent to the change in consumer surplus plus producer surplus caused by the impact. Where the impact predicted by the dose-response function is marginal, it may be possible to value the impact using relevant market prices, adjusted for any government interventions and market imperfections. For larger impacts, a modelling approach is likely to be required, to predict the resultant changes in prices and behaviour on both the supply and demand sides of the relevant markets. For example, in the case of an impact on a production process, a producer might respond to an impact by changing the quantity of other inputs used, which would alter the costs of production and thereby change the producer surplus. A change in the output price will change consumers consumption patterns, and thereby the consumer surplus. Prediction of such market responses is complicated. Individuals will often make complex changes in their behaviour to protect themselves against undesirable impacts. For example, farmers might switch to crop varieties that are resistant to pollution. A large number of markets might be involved, and modelling such an interrelated system can be extremely sophisticated. However, simple models can provide useful estimates, provided their shortcomings are recognized. The specification of the dose-response function is crucial to the accuracy of the approach. The pollutant responsible for the damage needs to be identified as well as all possible variables affected. Large quantities of data can be required. It may be possible to record the impact of change in the environmental variable using variables that are easy to observe and measure (e.g. leaf drop and discoloration of vegetation). However, some impacts (e.g. reduced plant vigour and reduced pest resilience) are difficult to observe directly. In such cases, an 'instrumental variable', which is easily measurable and provides an indicator of the impact of interest, can be used as a measure of the impact. As an alternative to empirical data, dose-response functions can also be specified using suitably validated simulation models, such as fishery models, crop yield models, and biological growth models. The use of dose-response functions is theoretically sound. Any uncertainty surrounding their use resides in the specification of the function itself and in predicting any behavioural responses that might occur. Dose-response functions are suitable for use in instances where the relationship between change in an environmental variable and the resultant impact on a good or service can be established (it cannot be used to estimate non-use values). It can be a costly technique to use where manipulation of large databases for physical and economic modelling is required. However, where the necessary dose-response functions already exist and impacts are marginal, the method can be very inexpensive to use with low demands on time, providing reasonable first approximations of true economic value. Direct valuation techniques seek to elicit preferences directly through the questioning of individuals on their willingness to pay for a good or a service. These techniques include the contingent valuation method, contingent ranking and conjoint analysis. The contingent valuation method can be useful for eliciting the value of several aspects of water resources including water quality, recreation and biodiversity. It can be employed to calculate both use and non-use values including option and existence values. A survey instrument is used to measure individuals maximum willingness to pay for an aspect of a water resource, presented to them in a hypothetical market with a proposed improvement (Hanley and Spash, 1993). The contingent valuation method can also be used to measure what people are willing to accept by way of compensation for a deterioration in quality of a water resource. Bateman et al. (2002) provide details of the procedures involved in contingent valuation. In general, a survey is conducted in which people are asked questions regarding the amount of money they would be willing to pay for an improvement in an environmental good or service. This may be conducted through face-to-face interviews, telephone or mail surveys. In developing countries, face-to-face interviews are considered the most appropriate (because of high rates of illiteracy and defective telephone networks). The design of the questionnaire is important and typically comprises three components. First, the questionnaire provides an explanation of the environmental issue of interest together with information on the change in quality. Second, it includes questions regarding willingness to pay or willingness to accept. The third part of the questionnaire comprises questions about the socio-economic characteristics of the interviewee, which enable analysis and verification of the validity of responses on willingness to pay or willingness to accept given by respondents. A respondents choice or preference can be elicited in a number of ways. The simplest is to ask a direct question about how much the respondent would be willing to pay for the good or service (known as continuous or open-ended questions). High rates of non-responses can be a problem with this approach. Alternatively, respondents can be asked whether they would want to purchase the service if it cost a specified amount. These are known as discrete or dichotomous choice questions, and may be favoured because they do not give the respondent any incentive to answer untruthfully, i.e. the approach is 'incentive compatible'. A hybrid approach is the 'bidding game', where respondents are asked a series of questions to iterate towards a best estimate of their valuation. Alternatively, respondents may be shown a list of possible answers - a 'payment card' - and asked to indicate their choice, though this requires a careful determination of the range of possible answers. Each approach implies particular requirements in terms of statistical methods, and the appropriate choice for a specific problem is a matter of judgement on the part of the analyst. One of the problems with the contingent valuation method is that it is subject to biases. The problem of strategic bias has long worried economists. The likelihood of the occurrence of strategic behaviour depends on respondents perceived payment obligation and their expectation about the provision of the good. Where individuals believe that they will actually have to pay their reported willingness to pay, but that their personal valuation will not affect whether the good is provided or not, there is a temptation to understate the true value in the hope to 'free-ride', i.e. that others will pay. However, if the price to be charged for the good is not tied to an individuals willingness to pay response, but provision of the good is, then overreporting of willingness to pay might occur in order to ensure provision. Incentive compatible payment methods might minimize the risk of strategic behaviour. Overall, the large amount of empirical investigation into the question has not substantiated fears of strategic bias problems. There are further sources of bias in contingent valuation method data. The hypothetical nature of the contingent valuation market causes hypothetical bias. It occurs because respondents answers could be meaningless if their declared intentions cannot be taken as an accurate guide for their actual behaviour. This is most likely to occur where respondents are very unfamiliar with the scenario presented to them. A careful and believable description of the good or service and its context can help in this instance. A survey of experimental tests, which compared hypothetical bids with those obtained in simulated markets where real money transactions take place, suggests that hypothetical bias can be reduced significantly if willingness to pay formats are used instead of willingness to accept. This is because respondents have more practical experience with payment than with compensation scenarios (Hanley, 1990). Analysts may wish to summarize respondents valuation estimates in terms of the mean willingness to pay for the good or service, or to develop an aggregate benefit estimate for a community or region. 'Aggregation bias' can arise through this owing to sampling errors or insufficient sample size. Sampling errors can arise where survey non-responses occur for certain types of individuals who are not distributed randomly in the population, resulting in a non-random survey sample. Similarly, where the sample size is small, there is a risk that the characteristics of the sample will not be representative of the general population. A number of studies have found evidence of 'payment vehicle bias', where willingness to pay depends upon the choice of the method of payment, for example, between an increase in taxes or entrance fees. Controversial payment vehicles should be avoided in favour of those most likely to be employed in real life to elicit payment for the good in question. However, dependence of respondents answers on the way in which they are asked to pay for the hypothetical good or service should be expected. This should not be a source of concern because preference for one payment vehicle over another may be perfectly reasonable. In this sense, the term 'bias' is misplaced. Starting point bias arises when the initial value suggested at the beginning of a bidding game has a significant impact upon the final bid reported by the respondent. The use of starting points can reduce valuation variance and the number of non-responses in open-ended type questionnaires. However, this can be at the possible expense of respondents not giving serious thought to their answers and taking cognitive 'short cuts' in arriving at their decision. One solution is to use a 'payment card', with a range of numbers from which respondents can select their bid. However, this can result in an "anchoring" of bids within the range presented. It has been argued that an optimal range of prices should include a low price that results in almost all respondents accepting it, and a high price that results in almost all respondents rejecting it. Within this range, prices offered should reflect the distribution of bids so that, ideally, each bid interval reflects the same proportion of the population (Bateman et al., 1992). Perhaps most controversy has centred on the so-called 'embedding effect'. A few studies have found that individuals contingent valuation responses often do not vary significantly with changes in the scope and coverage of the environmental good being valued (Kahneman and Knetsch, 1992; Desvousges et al., 1992). In these studies, respondents appeared not to discriminate between the particular environmental good under consideration and the general class of environmental goods it belonged to. A number of explanations have been advanced for this phenomenon. Some have argued that it occurs because individuals do not possess strongly articulated preferences for environmental goods, so that they tend to focus on other facets of the environment, such as the 'moral satisfaction' associated with the preservation of particular species or habitats (Kahneman and Knetsch, 1992) when deciding on a monetary valuation. Others (such as Smith, 1992) have argued that embedding is more an artefact of poor survey design. It has also been suggested that, in order to make valuation and financial decisions easier, people tend to think in terms of a system of expenditure budgets, or 'mental accounts', to which they allocate their income (Thaler, 1984). If the amount allocated to the 'environment account' is quite small, this might result in an inability to adjust valuations substantially in response to changes in the size and scope of an environmental good. Therefore, embedding may occur through this imposition in decision-making of an income constraint, which is inflexible and strict (relative to an individuals total income), and which determines valuations. The debate over embedding has not been resolved. Whether the effect is robust or not, it does appear that careful survey design can reduce its severity, in particular through the provision of precise, contextual descriptions of the good itself, and of the expenditure implications of a particular willingness to pay bid. There are numerous issues that arise in contingent valuation work in developing countries that demand careful attention in order to increase the likelihood of obtaining high-quality results. Interviewers need to receive a clear explanation of what the study is about and especially the concepts of economic value and maximum willingness to accept or minimum willingness to pay. Attention also needs to focus the presumed difficulty of understanding and interpreting respondents answers to sensitive or hypothetical questions. Focus groups are often used as an auxiliary to contingent valuation studies in order to explore peoples knowledge, perceptions and understanding of the subject of interest. This aids the design of the contingent valuation survey. It indicates the amount of information that needs to be presented, the manner in which to present it; and the way in which questions used in the survey can be refined (Desvousges et al., 1984; Hoehn, 1992). Focus groups can be employed following a contingent valuation survey (Burgess, Clark and Harrison, 1998) to provide insights into the processes that underlie the responses. They can also be used to discuss survey results with the stakeholders involved and relate these to the decision or decisions to be made. The National Oceanic and Atmospheric Administration (NOAA) panel has offered a set of guidelines that it believes should be followed if contingent valuation is to provide information on non-use values of sufficient quality for it to be usable as the legal basis for compensation claims for environmental damage (Arrow et al., 1993). The use of these guidelines within the profession is now being extended to cover all contingent valuation studies. Contingent valuation is likely to be most reliable for valuing environmental gains, particularly where familiar goods are considered, such as local recreational amenities. The use of contingent valuation to determine value has stimulated an extensive debate. It has been criticized for its theoretical background, the isolation from contextual issues, and for imposing a market construct and context on respondents. Contingent valuation studies are costly and entail an inevitable comprise between expense and quality. Environmental economists are accused of blind adherence to an outmoded neo-classical economic theory that lacks empirical verification and political consensus. For some critics, the supposed biases and practical inconsistencies found in contingent valuation surveys further undermine the validity and modern relevance of neo-classical economic value theory. A further criticism is that contingent valuation provides a snapshot of peoples attitudes, preferences and values at a certain point in time. Little attention is given to the background or context against which the values have arisen. Burgess, Clark and Harrison (1998) question the use of contingent valuation in environmental decision-making. They argue that people provide a monetary value for the environment because they are in a coercive interview situation or because of their trust in the expertise held by those asking the questions. They recommend that decisions about the environment should be based on social consensus about appropriate standards and acceptable choices rather than on individuals willingness to pay elicited through contingent valuation surveys. However, their critique may have been conditioned by problems in the contingent valuation case study that the authors use as an example. The survey was experimental and, therefore, does not conform to established 'best practice' (G. Garrod, personal communication, 1998). Nevertheless, in-depth group discussions (returned to later) do offer a different perspective on the elicitation of environmental values and are relevant to a comprehensive appraisal of the contingent valuation method. Contingent valuation is an attractive technique as it generates its own data. However, good-quality contingent valuation studies are costly in terms of time and resources. A good study will cost US$10 000-250 000; an expense that few agencies will agree to. Costs can be reduced by hiring low-cost interviewers, though this entails compromise in the quality of the study. Whenever possible, high-cost studies are to be preferred as they are more likely to produce information that is useful and valuable, and can lead to policy changes that more than cover their costs. Ultimately, the trade-off between expense and reliability is at the judgement of the analyst. Contingent ranking is implemented in the same vein as contingent valuation except that the respondent has to rank order a large number of alternatives that comprise various combinations of environmental goods and prices. A random utility framework is used to analyse the data on complete ranking of all the alternatives. The statistical estimation is often performed using essentially a multinomial logit model of the rank order of the random utility level associated with each alternative. Implicit attribute prices or welfare change measures are then calculated from the parameter estimates of the logit model. Applications of contingent ranking usually involve the ranking of large numbers of alternatives, which often appear similar to the respondent. The cognitive task of arriving at a complete ranking is very difficult. Furthermore, the estimated statistical models used are often poor representations and result in imprecise environmental values. Therefore, the contingent ranking method has met with a mixed response (Smith and Desvousges, 1986; Lareau and Rae, 1989). Conjoint analysis is related closely to contingent ranking. Individuals participate in a conjoint analysis experiment to undertake a large number of ranking tasks. Each ranking task involves a small number of alternative options. Based on the collected data, a type of utility index model is estimated for each individual. Therefore, it differs from contingent valuation and ranking. Conjoint analysis has strong foundations in psychology and statistics, but has a rather less sound theoretical foundation in terms of individual choice theory. However, there is a trend for valuation studies to move away from reliance on purely statistical methods towards more behaviour-based models. Environmental value transfer here refers to transfer of values for environmental costs as well as benefits (the latter is otherwise known as 'benefits transfer'). The costs of valuing impacts on the environment can be considerable. However, it is not always necessary to undertake a new valuation study. Where valuation has been undertaken for a similar case elsewhere, it may be possible to transfer the estimates and employ them as indicators of the economic welfare impacts in a new study. The original valuation may have utilized any of the valuation techniques outlined above. Environmental value transfer is undertaken largely for reasons of cost-effectiveness and scope to rapidly inform decision-making. It is a very attractive alternative to resource-intensive and time-consuming valuations based on original data. However, it is fraught with difficulties and subject to a number of caveats. the assignment of property rights for the resources under consideration should be the same. Desvousges et al. (1992) suggest that consideration should also be given to the sites in which the goods or services are located, and quality of the study. Three broad approaches can be used for environmental value transfer (Pearce, Whittington and Georgiou, 1994). One approach uses average value estimates. This approach assumes that the change in utility experienced by the individuals considered in the new study is equivalent to that experienced on average by individuals in the previous studies. For example, in the case of a change in resource management that affects recreation benefits, the change in recreation services would be valued in terms of individuals average willingness to pay per day. This could be estimated using values presented in suitable previous studies. Multiplying the resultant figure by the predicted change in the number of person days of recreation in the new study would yield the total aggregate value of the anticipated impact on recreation. A drawback is that the situations examined by the two studies are unlikely to be identical. Consequently, studies that are suitable for value transfer (according to the criteria listed above) are unlikely to be available. A second approach uses adjusted average values. This entails the adjustment of mean values from previous studies for any biases in the data to better reflect conditions examined in the new study. For example, adjustments might be made to reflect the socio-economic characteristics of households, the environmental change in question, the policy setting, or the availability of substitute or complementary goods and services. Such adjustments can increase the suitability of values for transfer. A third approach uses value functions. This entails transfer of the entire demand function for the good or service in question to the new study. It enables transfer of a greater amount of information than through use of average values alone. It is likely to result in better approximations of values, but is more involved than the other two approaches. Several limitations are common to all of the above approaches for value transfer: a requirement for good-quality studies of similar situations; the potential for characteristics to change between different time periods; and an inapplicability to the valuation of novel impacts. The quality of studies carried out using transferred values can be no better than the quality of the data in its original context (Green et al., 1994). Garrod and Willis (1994) found that for applications in the United Kingdom, even careful modification of available benefits estimates did not yield transfer estimates 'which were reliable and robust enough to be used with confidence in policy applications.' There is little published evidence that tests the validity of environmental value transfer. In the few studies conducted, transfer errors have been found to be substantial (Brouwer 1998). It may be possible to make value transfer more robust if, as well as socio-economic variables, essential physical variables, e.g. ecosystem characteristics and processes, are considered at the different sites. As more information about factors that influence environmental values becomes available, e.g. through meta-analysis, the transfer of values across populations and sites will become more practicable, using either only existing data or supplementing this with new original data. Environmental value transfer is still in its infancy, partly because only a limited number of high-quality valuation studies have been completed for many environmental impacts. However, it does offer a potentially important and useful means for valuation, and could feasibly provide accurate and robust benefit estimates at a fraction of the cost of original valuation studies. Meta-analysis has played an increasingly important role in environmental economics research since the beginning of the 1990s (van den Bergh et al. 1997). Originally used in medical and psychological research, meta-analysis uses statistical techniques to provide a quantitative comprehensive evaluation of what can be large volumes of data presented in multiple empirical studies. It enables researchers to explain variations in the outcomes of single studies based on any differences in underlying assumptions, standards of design and measurement. In the absence of meta-analysis, data presented in existing studies is usually assessed qualitatively. Meta-analysis offers important advantages. The analysis is objective, so does not prejudge studies or weight their findings subjectively on the basis of study quality (Glass, McGaw and Smith, 1981). However, results of meta-analysis can be biased through the inclusion of only significant study results; studies with insignificant findings are less likely to be published and, therefore, are not available for analysis. In addition, correlation can occur in the data if multiple results from a single study are assumed to be independent without application of the necessary statistical tests (Wolf, 1986). Meta-analyses have been carried out on the valuation of various functions of water resources, focusing either on the use of single or multiple valuation techniques. An increase in the use of meta-analysis has occurred, triggered by: (i) increases in the number of environmental valuation studies that are available; (ii) seemingly large differences in valuation outcomes caused by differences in research designs (Carson et al., 1996); and (iii) the high costs of original valuation studies, which has increased policy-makers demand for transferable valuation results. Meta-analysis can be used to identify criteria for valid environmental transfer. They are identified in the meta-analysis as factors that significantly explain variances in valuation outcomes. Meta-analysis can also be used to assess the convergent validity of value estimates. Convergent validity can be tested by splitting a data set in two. Half of the data set is used to identify significant factors. The other half is used to test whether value estimates based on the significant factors fall within the confidence interval of the estimates in the other half of the data set. Income multipliers measure the circulation of expenditures through an isolated economy, tracing the flow of money through individual sectors of the economy. The effect of expenditures in one sector on the whole economy is measured by multiplying the income multipliers by the expenditures. Although these changes in expenditures provide a measure of economic impact, they do not indicate net economic value or willingness to pay (Sorg and Loomis, 1984). They represent the redistribution of economic activity: transfers of surplus between regions, between people, and between industries. These sum to zero in economies with full employment. Therefore, changes in expenditures provide some evidence that an activity or amenity for which expenditures are made is of value but they do not provide guidance on the magnitude of this worth. Energy analysis has been used to estimate the value of ecosystems based on their biological productivity (Farber and Costanza, 1987). The total energy captured by ecosystems is used as an estimate of the total potential of ecosystems to perform useful work for the economy. The approach is considered to provide an upper bound on the economic value of the products of an ecosystem because not all of the products are used in the economy. The TEV of an ecosystem in providing biological products for an economy is determined by multiplying a money-to-energy conversion factor (measured in a monetary value per unit of energy) by the energy potential of the ecosystem. The resulting measure of welfare represents the total consumptive value of the ecosystem. However, non-consumptive benefits (such as some recreation values) are not accounted for in energy analysis-derived values. A further difficulty with this method is that there is no reason to expect the conversion factor between energy and the monetary value to be approximately constant. Deliberative group approaches are rooted in a distinct view of how decision-making procedures are, or should be, organized. Different cultural views on social relations are assumed to give rise to different preferences towards decision-making procedures for different kinds of issues, including environmental issues, e.g. Rayner (1984) in the context of risk management. These cultural foundations can be found to underpin the various approaches used for environmental valuation. The data produced by group discussions is qualitative. Consequently, special attention is required in order to make replicable and valid inferences from these data. This is necessary for the following three interrelated reasons. First, data communicated during qualitative social research may not have a single meaning, especially where the message conveyed is symbolic in nature (Krippendorff, 1980). Meanings are not necessarily shared. A message may convey a multitude of contents even to a single receiver and may convey different meanings to different people. Therefore, claims to have analysed the content of the information communicated during group discussions can be difficult to defend. Second, data and values are embedded in culturally defined worldviews; they cannot be considered to be independent. Consequently, 'facts' can be perceived differently across the various cohorts of society. Third, the qualitative data produced by group discussions are given meaning within at least two distinct contexts: (i) the group context in terms of the various cultural and social-economic backgrounds of the group members; and (ii) the context as constructed by the researcher. These two contexts need to be stated explicitly in order to identify the boundaries beyond which the analysis cannot be extended legitimately (Krippendorff, 1980). The results can only be validated if the purpose of the analysis is stated unambiguously and the context in which the data were produced is defined clearly. The use of discussion groups is also open to criticism. From a 'critical realism' point of view (Bhaskar, 1989), it can be argued that group discussions may not be mere consultations or mechanisms to reproduce underlying social relationships. Instead, they can constitute scientific and political 'transformational interventions' that are open to manipulation and steering. However, participatory and deliberative approaches to environmental valuation gain in transparency and meaningfulness where the balance between the self-interest and community-based interests of individuals acting as both consumers and citizens is made more explicit. This section examines how the valuation techniques discussed above are applied in practice to the economic valuation of water resource functions. The approach taken here employs the concept of functions to link water resource catchment structures and processes to their various uses that give rise to goods and services. The structures and processes determine a variety of functions that can be categorized according to whether they are hydrological, biogeochemical or ecological functions. This section considers the economic valuation of a selection of some of the more important and less well-understood. The application of the valuation techniques to many of the functions has already been considered extensively elsewhere (Gibbons, 1986; Young, 1996; National Research Council, 1997; Renzetti, 2002), and hence discussion of these is limited here. Table 7 shows a summary of many of these functions and the techniques applied to them. In addition, Table 8 summarizes this information according to the main sectoral uses of water. In addition to the discussion provided in this section, the Appendix provides a number of more detailed case study examples of the techniques in practice. The adoption of an extended catchment-scale perspective has the advantage that it is easier to identify and take into account the interdependence that exists between the socioeconomic impacts of water resource functions. An example of this interdependence arises in the case of the hydrological functions of groundwater recharge and groundwater discharge. The groundwater recharge function may in itself have no impact on human welfare, but it has value in that it provides storage of water in aquifers for later discharge as surface water. Moreover, the processes involved can remove pollutants, thereby enhancing water quality. Care is required to ensure that such interdependence between functions does not result in double counting of benefits (which can occur if one function is integral to another, but they are valued separately and aggregated). In what follows, a selection of functions is listed, along with some brief discussion of the application of possible techniques for their valuation. This is the short- or long-term detention and storage of water from over bank flooding and/or slope runoff. Under the hedonic pricing approach, hedonic pricing can be used to analyse the price differential for properties at risk from flooding. It entails analysis of all variables that could affect price, such as location, size, aspect, and age of property. Use of hedonic pricing requires existence of a property market and existence of known and distinct risks of flooding. It is a complicated procedure that is subject to various complications. Defensive expenditures to reduce flood damage can counter impacts of flooding on property prices (Holway and Burby, 1990). A further complication is that perceived risk of flooding and the resultant impact on house prices can diminish as memories of previous flooding episodes fade (Tunstall, Tapsell and Fordham, 1994). Moreover, house prices may reflect flood hazards only where flooding has occurred relatively recently, regardless of the expected frequency of flooding (Tobin and Newton, 1986). Under the contingent valuation approach, floodwater control can be valued by asking the affected population what they would hypothetically be willing to pay to either avoid flooding (of some area of interest) or to avoid an increase in the frequency of flood episodes. Given the analytical and resource demands of contingent valuation survey, this is best limited to valuation of the impacts of flooding that are not non-marketed, such as impacts on unique ecosystems. Change in welfare from change in availability of potable water. Change in human health or health risks. Change in value of crops produced or production costs. Change in cost of maintaining public or private property. Change in value of livestock products or production costs. Change in value of food products or production costs. Change in value of manufactured goods or production costs. Change in cost of electricity generation. Change in animal health or health risks. Change in economic output or production costs. Change in quantity or quality of recreational activities. Commercial fishing, hunting, trapping, and plant gathering. Change in value of commercial harvest or costs. Change in quantity or quality of on/off-site observation or study activities. Change in personal utility or well-being. Note: MP/DF = market price/demand function; SCF = supply or cost function; C/PCS = consumer/producer cost savings; CV/CR = contingent valuation/contingent ranking; TC = travel cost; AB = averting behaviour; HP/W = hedonic price/wage; BT = benefits transfer. Source: Modified from National Research Council (1997) and Bergstrom et al. (1996). The damage costs avoided approach considers the costs that would be incurred if flood control provision (e.g. the flood protection provided by a wetland) were not present are given by the damage costs. These consist of direct costs, indirect costs and intangible costs. The direct costs of flooding are incurred by physical contact with the floodwaters. Costs of damage to the built environment are determined by the type of building (e.g. residential, commercial and industrial) and factors such as the design, function, density and age of the buildings. Cost estimates can be obtained from relevant publications, e.g. the 'FLAIR blue book' in the United Kingdom (NJai et al., 1990), government agencies, and site-specific surveys conducted by government agencies or insurers. In determining the costs of damage to movable assets, account needs to be taken of avertive action. For example, in a study of flooding in Maidenhead, United Kingdom, Tunstall, Tapsell and Fordham (1994) found that the reduction in damages by avertive action was "substantial". Higgs (1992) allows for a reduction of 5-10 percent in damage costs resulting from items being moved away in advance from flood-prone areas. Flooding also imposes costs on productive activities in the non-built environment. Damage to natural ecosystems (wetlands, woodlands and meadows) may be minor and temporary. However, the costs can be substantial for intensive agriculture. Losses in returns to agricultural production are determined by: the depth, extent and duration of flooding; the effluent and silt content of the floodwaters; types of crop, expected yields and price. Silt exacerbates the volume of flooding and is itself a cause of damage. Clark (1985) estimated that silt accounted for 20 and 7 percent of urban and rural flood damage respectively for a study in the United States of America. Turner, Dent and Hey (1983) have calculated returns from agriculture, as the opportunity cost of wetland preservation, based on detailed analysis of output, fixed and variable costs and transfer payments (agricultural subsidies). Estimates of standard losses in agricultural gross margins due to flooding may also be available from official publications (e.g. the Farm Management Pocketbook for the United Kingdom). Long-term impacts on agricultural production through continued exposure to inundation are reflected in the value of the land. Flooding affects the land use categorization of land and this is reflected in the market price (Boddington, 1993); average price data for land use categories is often available from official publications. Flooding also results in indirect and intangible costs. Disruption to physical and economic linkages in the economy causes indirect costs. They include: costs of implementing immediate emergency measures; reduced production, and the knock-on effects of this on production elsewhere; impacts on transport; and increases in living expenses. By definition, intangible costs are not readily quantifiable. Examples include psychological effects (stress caused by flooding and worry about future events) and poor health caused by flooding. Some costs formerly described as intangibles are now being quantified, such as the effects of disruption and evacuation (Green and Penning-Rowsell, 1986; 1989). Intangible costs could be more significant that the direct damages of a flood episode (Green and Penning-Rowsell, 1989). It is best to acknowledge that such costs are expected but cannot be valued, and that the total cost of damage (and hence the value of the wetland flood protection function) is underestimated as a result. Defensive expenditures provide only a minimum estimate of the benefits of floodwater control as they may omit costs of flooding against which defensive actions are not taken. Furthermore, defensive expenditures tend to be low relative to potential damages as individuals underestimate the likelihood of flooding and overestimate their ability to cope with its effects (Tunstall, Tapsell and Fordham, 1994). Defensive expenditures include relocation of assets, such as buildings, nature reserves and livestock (Boddington, 1993), rewiring of electrical points above expected flood levels, and raising of houses on stilts or piles (Tunstall, Tapsell and Fordham, 1994). Relocation may not be to a site that is a direct substitute. Therefore, relocation costs need to be attributed accordingly between the various benefits, and any disadvantages also need to be taken into account. The replacement cost of flood control can be determined, for example, through the use of shadow projects. In the case of the floodwater control function of a wetland, a shadow project could entail creation or restoration of another wetland that would perform the same function within a given catchment. This would also replace other functions of the wetland and would, therefore, be particularly appropriate in a situation where total loss of a wetland is threatened. Locally relevant costings for wetland creation or restoration are likely to be sparse (although mitigation banking has led to considerable creation and restoration of wetlands in the United States of America). There is uncertainty associated with 'engineered' ecosystems and the functions they can perform. This is more pronounced where the location of the shadow project is distant from the original site and the benefits are consequently derived by a different population. For shadow projects that entail a change in land use for a site (e.g. taking land out of agricultural production), the analysis must also include the opportunity costs of this. This is the recharge of groundwater by infiltration and percolation of detained floodwater into a significant aquifer. The groundwater recharge function is only of value where the recharged groundwater is of some benefit to society. The benefits may be direct, such as abstraction of the water for irrigation or domestic use, or indirect, such as the maintenance of water table levels. In addition to these use values of recharging groundwater, there may also be non-use values of maintaining groundwater supplies. Non-use values can be attributed to the maintenance of groundwater supplies for subsequent generations, but only if use of the reserves is anticipated. Table 1 shows the potential extractive and in-situ uses of groundwater acting as a water reserve (stock). As far as the extractive uses are concerned, the techniques involved in assessing the economic value of groundwater recharge are much the same as those outlined below for the 'groundwater discharge/surface water generation' function. Studies that have considered values for groundwater supply are outlined in that section as they illustrate techniques that may also be useful for assessing the value of surface water. They include: hedonic pricing based on variations in availability of groundwater irrigation supplies; costs of establishing substitute well sites; and contingent valuation of willingness to pay for alternative piped water supplies. A number of studies have assessed values associated with maintaining the quality of groundwater (which may be relevant to the in-situ uses of the recharge function) and these are considered under the "nutrient retention" function. Two other in-situ use values arising from groundwater recharge include prevention of land subsidence and saltwater intrusion. Concerning the prevention of land subsidence, hedonic pricing is used to analyse a price differential in property that is attributable solely to the risk of subsidence. Where identical sets of housing exhibit variation in prices, and the only non-constant attribute is the risk of subsidence, then price differences can be related to the buyers willingness to pay to avoid subsidence. However, it is necessary to assess all relevant variables that could affect price (e.g. location, size, aspect and age), and to isolate the effect of subsidence from these. Regarding damage costs avoided, predominant land uses are identified and the various costs of a potential subsidence assessed. Estimation of the damage costs avoided owing to groundwater recharge provides an upper bound estimate of the value of this function as it does not technically value societys willingness to pay to avoid the subsidence. Instead, it values the full extent of costs expected to result from subsidence, which could exceed the cost of alternative measures to negate the economic impacts. However, it may not be feasible to estimate all the costs involved, particularly the intangible costs. Residual imputation and variants can be applied to the case of saltwater intrusion. Intrusion of saltwater can occur as a consequence of falling groundwater in levels in areas in proximity to the coast. Saltwater intrusion can render groundwater unusable for irrigation, thereby impinging directly on agricultural production. The change in net returns that this would cause can be used to assess the value of maintaining groundwater levels to prevent the intrusion of saltwater. Groundwater discharge and surface water generation can be considered as identical functions for valuation purposes. Whether water originates from direct precipitation, groundwater discharge or another source does not influence the value attributable to surface water generation. The surface water generated contributes to the stocks and flows of surface water, which support a variety of in-situ and extractive uses as well as non-use values. Table 1 shows the potential extractive and in-situ uses of surface water, and its interrelationship with groundwater. Extractive uses of surface water include use of water for irrigation and domestic purposes. In-situ uses of surface water are more varied and can include maintenance of habitats and provision of aesthetic and recreational value. Several of the in-situ uses of surface water are also considered within other functions. For example, the reliance of characteristic wetland ecology on surface water and anaerobic conditions resulting from inundation (and the subsequent capacity to retain excess nutrients) are considered under the 'ecological' and 'nutrient retention' functions, respectively. Downstream habitat and biodiversity maintenance are considered below only in so far as they might contribute to recreational and amenity value. Other benefits associated with maintaining biodiversity could be significant (e.g. non-use values) and valuation methods for these are outlined in the section on 'ecological' functions. As mentioned above, the techniques outlined below for valuing extractive and in-situ uses of surface water are also applicable to the extractive uses listed under the groundwater recharge function. The main extractive and in-situ uses and techniques to value them have already been considered comprehensively in, for example, Gibbons (1986); Young (1996); National Research Council (1997), Renzetti (2002). Hence, only a few illustrative application examples are presented here. One example concerns the use of market-based transactions. Surface water abstraction for use in irrigation can be valued using market prices observed in rentals and sales of water rights. In order for traded water rights (for a specified period or for a permanent right) to reflect the economic value of water use, allocation and enforcement of property rights is required. If necessary, prices should be adjusted to reflect long-term considerations (i.e. social values). In practice, rental rates may be affected by factors other than the marginal value of water. Although observations of prices on markets for perpetual water rights are more appropriate for long-run planning contexts, some degree of care is required in converting this capitalized asset value into the annual values used conventionally in planning and policy analysis (Young, 1996). Furthermore, in circumstances where agricultural subsidies supported crop prices, the use of water right prices will lead to overestimation of the social value of irrigation water. Another example concerns the use of residual imputation and variants. This is one of the most widely used techniques for valuing irrigation water. Ruttan (1965) employed it in an early study that demonstrated the difference between the value of irrigated and non-irrigated agricultural production. Some degree of care has to be taken with its use in order to ensure that statistical problems, such as multicollinearity between variables, do not bias the analysis. Linear programming models have been applied to farm budget data to derive shadow values on irrigation water (Colby, 1989). Here, crop type is the most important determinant of the marginal value of irrigation water. The presence of uncertainty makes valuation of agricultural water use difficult owing to uncertainty in the need for irrigation (e.g. arising from climatic variation) and in water supplies. Therefore, farmers attitudes towards risk must be considered when undertaking studies. Furthermore, market distortions and externalities also need to be taken into account. The Appendix contains a case study example for a multiple use irrigation system in Sri Lanka. Another technique is that of derived demand functions. This technique has been used to estimate households valuation of domestic water supplies employing relatively easily acquired price and quantity data, e.g. in Young and Gray (1972) and Gibbons (1986). Although these studies addressed households valuations of a given quantity of water, they did not address complications created by variations in water quality or service reliability. These issues have been considered in studies using contingent valuation and avoided cost approaches. In principle, hedonic pricing can be used to derive the value of maintenance of river flows by surface water generation (Loomis, 1987). Individuals or businesses (including farms) might pay a premium for property located close to a river. It may be difficult to distinguish use of water in the river from other locational factors, such as benefits associated with aesthetics, recreation or transportation that result from proximity to the river. It is also difficult to determine the contribution made by the discharge of groundwater to maintenance of water levels in the river. Few studies have used hedonic pricing to value surface water generation, presumably because of these complications and demands of the technique. One of the few examples decomposes the value of agricultural land as a function of its attributes including the use of irrigation water (Faux and Perry, 1999). The Appendix provides an example of a detailed case study of water supply in the Philippines. Concerning the use of the replacement cost/avoided cost technique, avoided cost has been used to value hydroelectric power generation (see Gibbons, 1986). The cost that would be incurred if an alternative source provided the capacity to generate power is used to impute the value of the hydroelectric power generated. However, the method is problematic as it ignores the price elasticity of demand for electric energy. The approach can also be applied to valuation of surface water generation where water is abstracted to provide drinking-water. However, the expense of finding an alternative water supply is likely to be exceeded by benefits of continued use of the existing source. The technique may be particularly suited to this application where there is difficulty in valuing the health implications of restrictions in water supply. This concerns the storage and removal of excess nutrients (nitrogen and/or phosphorus) from water, via biological, biochemical, geochemical, physical and land management processes. The main impact of storage of nitrogen and phosphorus is improved water quality. Thus, this function is discussed here with respect to water quality. Improvements in water quality have a number of benefits, as discussed in Chapter 1. A few illustrative examples of valuation of the benefits of improved water quality are outlined below. Impacts on recreation can be valued using the travel cost method. The benefits for drinking-water supplies can be considered, for example, via defensive expenditures. Indeed, nutrient retention benefits can be considered generally in terms of the costs of providing substitute treatment facilities. Potential increases in the costs of industrial production processes are not considered here. The residual imputation methodology (discussed above) could also be employed to value the benefits of improved water quality as an input to production processes. The travel cost method has been used to assess the value of improved water quality at recreational sites. A complex form of travel cost analysis, which includes measures of water quality as independent variables, is applied to sites that vary in water quality (but are similar in other attributes) or to one site for which water quality changes over time. This is an extremely involved procedure, which measures only the recreational benefits associated with improved water quality downstream. There are a number of difficulties with such analysis. In particular, for a multisite study, the influence of water quality between sites needs to be isolated from other varying attributes that might affect recreation demand. In the case of a single-site temporal study, changes in water quality need to be isolated from other attributes that might change over time. Smith and Kaoru (1990) undertook a meta-analysis of travel cost studies relating to water-based recreational values. They found that five features consistently had an influence on results: type of recreational site; the definition of the usage and quality of a site; measurement of the opportunity cost of time; the description of substitutes; and specification of the demand model. Regarding the hedonic price method, the price of properties in close proximity to waterbodies can be affected by the quality of the water and, therefore, by nutrient retention. The value of the nutrient retention function is derived from: (i) property values that are attributable to water quality; and (ii) the role of the function in maintaining the water quality. This entails analysis of prices for otherwise similar properties that are located close to polluted and unpolluted waterbodies. However, the data demands are considerable. A rough approximation of value can be derived directly from a summation of adjustments in property prices, which could be based on assessments of experts, such as estate agents, rather than actual observed price differentials in the property market. Regarding the defensive expenditures/avoided cost approach, the value of improved water quality can be estimated based on the expenditures undertaken by people to avoid consumption of poor-quality water. The sum of defensive expenditures on marketed goods, such as water purification equipment, represents the lower boundary on societys willingness to pay for improved water quality. This accounts only for changes in behaviour made by consumers in response to poor water quality. It does not take into account consumers who do not undertake defensive actions but would nonetheless prefer improved water quality. Such individuals may be inhibited from acting by inconvenience associated with the defensive activities, or lack of information about pollutant levels and possible adverse effects. Abdalla, Roach and Epp (1992) used this valuation approach to determine the time and money that households expend to avoid risk arising from groundwater contamination. Their approach assumes that households undertake a two-step decision-making process in which they first decide whether to undertake any avertive action, and then decide on the intensity of those actions. Abdalla (1994) also provides a survey of the literature on averting cost methods. The retention of nutrients can be valued using the replacement cost in terms of the cost of substitutes. Substitute activities include reduction of nitrate and phosphate pollution at source by limiting applications of agricultural fertilizers or by the installation of water treatment facilities. The replacement cost is particularly useful where the benefits of reduced nutrient loading are difficult to estimate. Examples include estimation of the benefits of avoiding deleterious health effects or the benefits of maintaining water quality and ecosystems for future generations. This concerns the net retention of sediment carried in suspension by surface water, including runoff from the contributory area and overbank flooding. Retention of sediment reduces the sediment load in water downstream and thereby improves water quality. The value of this may be most readily estimated in terms of the additional costs that industrial and municipal users of water would incur through the necessity for water treatment in the absence of sediment retention. Higher water quality may also lead to increased opportunities downstream, e.g. for recreation and commercial fisheries, and may have biological impacts on survival of habitats and species. Habitats and biodiversity are considered here only in so far as they might contribute to recreational and amenity value. Techniques for valuing the benefits of improved water quality (or the costs of poor water quality) are covered under the 'nutrient retention' function (above). Additional benefits of reduced sediment loads include mitigation of damages to water conveyance facilities. Such damages can occur through deposition of sediment in rivers, drainage ditches and irrigation canals, which can lead to adverse effects on navigation and water storage capacity, and can increase flooding. Some of the techniques for valuing those benefits that have not already been considered under other functions are discussed below. Regarding the techniques of avoided cost/damage costs, the benefits of maintaining navigation can be estimated in terms of the avoided costs of alternative transport. This approach does not usually account for the differences in speed between alternative modes of transport. Alternatively, the benefits of maintaining navigation can be valued as the damage costs avoided in terms of reduced accidents and groundings. However, values are likely to be low, especially where the costs of infrastructure have already been accounted for. The benefits of mitigating damages to water conveyance facilities, such as deposition in drainage ditches and irrigation canals, is peculiar to the sediment retention function. Estimating the damage costs avoided in terms of the costs of reversing possible adverse impacts is the most appropriate valuation technique to use. Considering the application of residual imputation and variants, the presence of fine silt particles in water used for irrigation can lead to a loss in productivity, as they can seal the surface of the soil, making it impermeable. However, the addition of sediment can increase soil fertility and thereby improve productivity. As sediment impinges directly on agricultural production, for which market prices exist, then changes in marketed outputs can be used to assess the value of sediment retention. This concerns the provision of habitat for animals and plants through the interaction of physical, chemical and biological processes. The economic value of ecological functions is generally only derived through contact with or concern for species or habitats that are components of an ecosystem. Thus, it focuses on aspects of biodiversity (both quantity and variety of organisms). With respect to biodiversity maintenance, the valuation techniques of relevance include: contingent valuation, hedonic pricing and replacement cost. Contingent valuation can be particularly useful for assessing the value of biodiversity maintenance, indicating willingness to pay for conservation of biodiversity. It is the only technique currently regarded as suitable for estimating non-use values associated with the maintenance of species diversity and population sizes. By definition, these values are not reliant on individuals visiting the site (so are not associated with measurable changes in behaviour). Brouwer et al. (1997) provide a meta-analysis that attributes values to various ecological functions estimated from a large number of contingent valuation studies. With hedonic pricing, differences in property prices that can be attributed to aesthetic and amenity benefits of proximity to a wetland can provide a value for maintenance of biodiversity on the wetland site. This requires analysis of prices for otherwise similar properties that are located close to and distant from wetlands with a diversity of species. The replacement cost of the biodiversity maintenance function is based on the costs of creation or renovation of an alternative. To provide a replacement, the alternative is required to provide similar habitats to the original site. Indeed, a possible management option would entail relocation of species to an alternative site. To have corresponding value, the alternative site is required to provide the same benefits. These are influenced by the location of the alternative site: its proximity to population centres, ease of access and availability of substitute sites. There is also the question of 'authenticity'. The original, naturally occurring site may be preferred to an exact replica, thereby affecting amenity and non-use values. Valuation using the replacement cost is most straightforward for sites that predominantly provide the single function of biodiversity maintenance. For sites that provide multiple functions, the costs of replacement are attributed between the respective functions. Opportunity costs of the conversion of the alternative site and any externalities are also taken into account. In addition to biodiversity maintenance, anthropogenic export of this biodiversity is also an important ecological function. This has consumptive use value associated with commercial exploitation, subsistence provision, and recreational use. The value of commercial exploitation of fish, shrimp or timber harvesting can generally be assessed through analysis of market prices. Subsistence value can be more difficult to estimate because the products are not marketed. However, market prices may exist for the products, alternative products or inputs to production that can be used as surrogates for prices. Consumptive recreation activities most often involve fishing and hunting. These can be assessed using the travel cost method or the contingent valuation method. There have been a number of reviews of water resources in the past three decades. Early surveys were undertaken by Young and Gray (1972) and Gibbons (1986), while more recent work includes Moore and Willey (1991), Young (1996), Frederick, VandenBerg and Hanson (1997). Renzetti (2002) provides an up-to-date survey of the water demand literature. There have also been a number of specific surveys of the value of water in specific uses. For example, Bogess, Lacewell and Zilberman (1993) consider the economics of water use in agriculture. These reviews are based on sectoral views of water resources, which despite the approach advocated here, are useful in highlighting important themes that have implications for policy. In their review of water valuation studies, Frederick, VandenBerg and Hanson (1997) found wide variation in estimated values across water use sectors (summarized in Table 9). While not the lowest, values in the irrigation water sector tended to be much lower than domestic and industrial uses. However, these figures are based on an unevenly distributed sample of studies across the different sectors. While there are a relatively large number of studies in irrigation and recreational uses, few studies have been undertaken for industrial and domestic applications. A similar picture emerges from an analysis undertaken by Briscoe (1996) using data from developed and developing country studies (summarized in Figure 11). The value of irrigation water in industrialized countries: irrigated agriculture accounts for a large proportion of water use, especially in many water-scarce areas, and the value of water for many low-value crops, such as food grains and fodder, is universally very low. Nevertheless, the value of water can be high (of the same order of magnitude as values in M&I end uses) where reliable supplies are used on high-value crops. The value of irrigation water in developing countries: a similar picture to that for industrialized countries is found in developing countries. Where water is used on high-value crops, including fruits, vegetables and flowers, then the value of water, as reflected in active and sophisticated water markets, can be high (typically around US$0.05/m3). 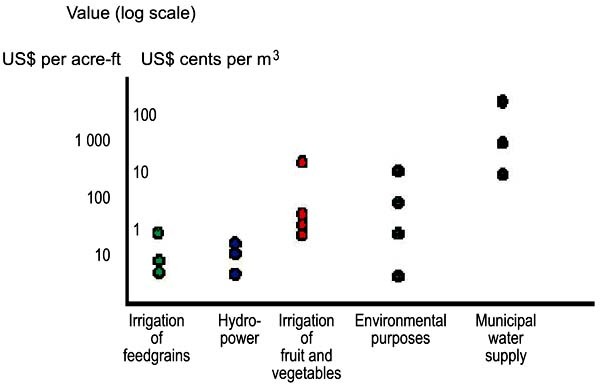 However in many public (mostly surface) irrigation systems, the quality of the irrigation supply is poor, food grains are the major crop produced, and the value of water is typically only about US$0.005/m3, orders of magnitude lower than for private irrigation schemes that use groundwater. The value of water for hydropower: the short-run values for use of water in hydroelectric power generation in industrialized countries are typically quite low, often no higher than the value in irrigated agriculture. Long-run values are even lower. The economic viability of hydropower depends on factors in the economy, the power sector and the water sector. Hydropower is most likely to be worthwhile where water is abundant and there are few competing uses. In developing countries, high environmental costs of alternative sources of power and a growing demand for power may make hydropower an attractive option. It is sometimes argued that hydropower is a non-consumptive use and as such does not impose externalities on others. However, in reality, it can modify flow regimes with the result that major costs are imposed. The key issue is not consumptive or non-consumptive use, but the costs imposed on others by a particular use of the resource. The value of water for household purposes is usually much higher than the value for most irrigated crops. Within household usages, the value for 'basic human needs' is much higher than the value for discretionary uses (such as garden watering). Reliability of supply is an important factor in how the resource is valued. The value of environmental and ecological purposes varies widely but typically falls between the agricultural and municipal values (as shown in Figure 11). Source: Frederick, VandenBerg and Hanson (1997). Given the focus on the functional perspective in this report, the Appendix provides a review of a large selection of water resource valuation studies relating mainly to the uses provided by the hydrological, biogeochemical and ecological functions under the functional perspective. The review is not comprehensive but it does indicate that valuation techniques have been applied extensively in both developed and developing countries to a large range of water resource functions. It further indicates that significant economic values have been attached to these various functions. Such a review could form the basis of a meta-analysis, although this is beyond the scope of the present study.